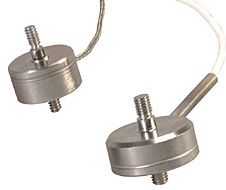 Small and capable of highly accurate readings, the LCMFL subminiature load cells are suitable for precision industrial applications. They are all stainless steel, measure either tension or compression loads, and have male thread studs for load attachment. The exclusive internal design provides superior long-term stability and minimizes the effects of small off-axis loads. 1/8 DIN 4 digit panel meter for load cell input. With built-in excitation power supply. 230Vac powered. 1/8 DIN 4 digit panel meter for load cell input. With built-in excitation power supply. 115Vac powered. Nota: Comes with 5-point calibration certificate (in tension).